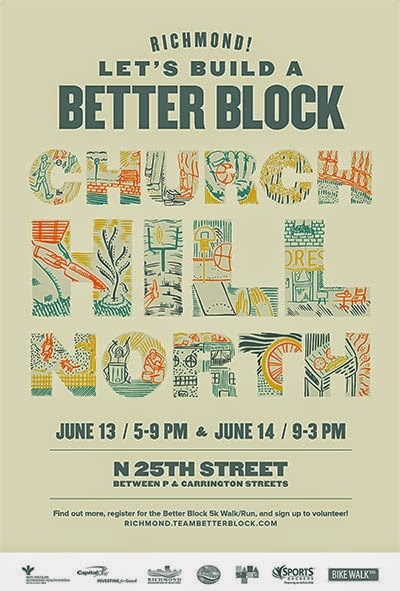 Change is coming to North Church Hill on June 13 and 14 and its name is Better Block. Better Block is a planning tool that allows residents and businesses to come together to make a positive impact on the community. Founded by Jason Roberts, the goal is to “create a safer and more inviting environment for people to work, play, and thrive” — in two days. For the first time, this movement is coming to Richmond in partnership with Richmond Sports Backers Bike Walk RVA. "The Sports Backers are excited to partner with Bon Secours, Capital One, the City of Richmond, the Richmond Area REALTORS, DaVita Dialysis and a number of other East End stakeholders to bring to life the full potential of the North 25th Street corridor of Church Hill North and Union Hill. For two days, we will see what a vibrant, walkable and bikeable street really looks like, with hopes that many of these changes will become permanent in the immediate future," said Max Hepp-Buchanan, Director of Richmond Sportsbackers Bike Walk RVA. Any community can use this model for rapid neighborhood revitalization; the open-sourced tools are provided by Team Better Block to assist with “planning, designing and measuring the impacts of better block as an alternative to the typical urban planning process.” For more information about hosting a Better Block project, and to see other examples of Better Block in action, visit www.betterblock.org. Find out about the upcoming event in North Church Hill. Follow Better Block RVA on Facebook for the latest developments.